Can our Constitution be manipulated in such a way as to pave way for an autocracy? Can a Hitler-like dictator rise from the Indian soil by curtailing the powers of our Parliament? How can a Presidential Order sneak its way into our statute book without going through the procedure prescribed for any constitutional amendment? Apart from the curtailment of rights of women, Scheduled Castes and Tribes and the negation of fundamental rights of Indian citizens, Article 35A poses a great danger to the very existence of Indian democracy. The way it was introduced as an article of our Constitution without reference to Parliament raises several pertinent questions. Can our Constitution be manipulated in such a way as to pave way for an autocracy? Can a Hitler-like dictator rise from the Indian soil by curtailing the powers of our Parliament? How can a Presidential Order sneak its way into our statute book without going through the procedure prescribed for any constitutional amendment? Can a political agreement between two politicians, in this case, Nehru and Abdullah, form the basis of a far-reaching constitutional amendment including the amending powers of Parliament, that too by ignoring the Parliament? The answer to these questions is hidden in the genesis of this unique Article 35A. It was not that simple, Nehru was trying to hide more than he was showing. Economic interests of permanent residents can be protected by the state government under its own legislative powers. Any state government can pass such laws which impose some valid restrictions on non-resident persons in purchasing landed property and get certain types of employment. We do not need Article 370 and to bolster it, Article 35A for such purposes. 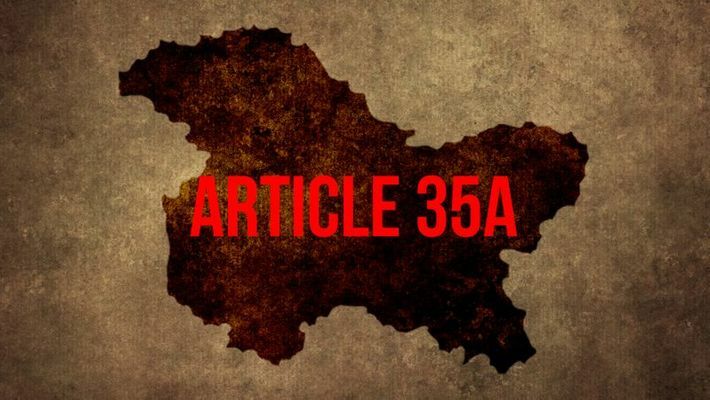 Article 35A grants a legal right to the state government to disable the Parliament of India and the Supreme Court of India to intervene in any law passed by the state government, however cruel and discriminatory it might be. It is an article to keep India out of Jammu and Kashmir permanently. However presently, we are not concerned with Article 35A, we are concerned with the unusual way adopted for bye passing the Parliament to introduce a new article because this way leads directly to dictatorship. How does the Parliament amend an article or introduce a new one? A Bill is presented in Parliament suggesting the proposed amendment. The Bill is admitted and debated. After considering all the suggestions, the Bill is put to vote. If it is passed by two-thirds members of the Lok Sabha, it is introduced in the Rajya Sabha. The same procedure is adopted in the upper House as well. A Bill seeking any amendment has to get two-thirds votes in both the Houses of the Parliament. It must be understood that an amendment means any alteration, addition or reinterpretation in an existing article. The same procedure applies to the introduction of a new article as well. Our Parliament has not provided any short cut or alternative procedure to make any amendment to our constitution. In such case how did a Presidential Order became a regular article of the Constitution? The only way it could have been possible is if the President used some unknown emergency powers to amend the Constitution, ignoring the Parliament. But India’s President does have any such powers! No authority apart from Parliament can amend the Constitution. That is the belief held by common citizens and legal authorities so far. We have been told that no government can tamper with the Constitution. Then how has an article remained in our statute book for several decades, which has amended several articles of the Constitution in order to curtail the fundamental rights of Indian citizens? Let us imagine the process adopted by its promoters. Then Prime Minister Nehru and Sheikh Abdullah had a meeting in 1952 in Delhi. They made an agreement called the Delhi Agreement. They agreed that Article 370 needs to be fortified in such a way that no Indian government is able to change it in the future. Sheikh wanted a constitutional guarantee for it. That is how the concept of Article 35A could have evolved. Sheikh was dismissed and arrested in 1953. Charges were serious including anti-national activities. One of the parties had backed out from the so-called Delhi agreement. Even then in 1954, Nehru again raked up the issue. A suggestion was sent to the President. I am not sure if it was forwarded by the cabinet or not. However, the President had to accept it because the Constitution does not give him the final veto power. He issued the application order. So far so good. But how did the order convert itself into an article of the constitution? If a government can manage to amend the constitution in such a manner once, why can’t any other government do it again and again? This article is a snub to our parliamentary governance and a challenge to our judicial system.